Medical research is showing that by incorporating IONIZED 9.5ph Alkaline Water into your diet you may help prevent the type of cell damage in the pancreas that can lead to diabetes. As Diamond Creek IONIZED 9.5pH Alkaline Natural Spring Water is IONIZED, it provides a rich source of extra oxygen to your cells – almost double the amount in tap or bottled water. Higher oxygenation = more energy. 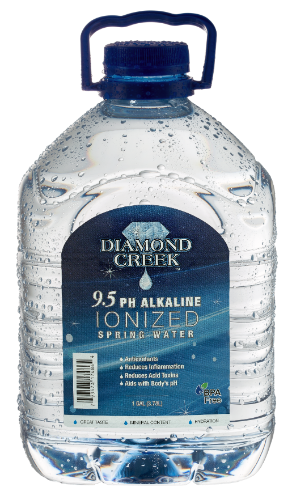 Diamond Creek IONIZED 9.5pH Alkaline Natural Spring Water clusters pass through the body’s tissues more easily, therein flushing your system of toxins and acid waste. A typical diet of cooked, pasteurized and processed foods leads to acidic pH. This acidic condition creates an ideal environment for disease to thrive. Diamond Creek IONIZED 9.5pH Alkaline Natural Spring Water helps bring your body’s pH back into balance helping with acid reflux. The size and shape of the IONIZED water molecule cluster is reduced, which allows it to pass through your tissues more easily. Drinking Diamond Creek IONIZED 9.5pH Alkaline Natural Spring Water water avoids a primary cause of disease – chronic cellular dehydration. that neutralizes free radicals – which may cause damage to our cells, allowing degenerative diseases to occur. Diamond Creek IONIZED 9.5pH Alkaline Natural Spring Water provides a similar effect to some of the most powerful antioxidants available. Proper hydration with Diamond Creek IONIZED 9.5pH Alkaline Natural Spring Water plays a critical role in your health and well-being. Today we are more conscious of the things that we consume and the possible negative effects that has on our overall well-being. One way that we can help our bodies to function more efficiently is by trying to limit the intake of highly acidic foods and drinks. The majority of the products we take into our bodies, like soda pop, create acid wastes in our system. Acidosis, Dehydration, and Free Radicals. Acidosis: The pH level of our bodies fluids affects every cell and being overly acidic can have can have a big impact on the health of our bodies. Being chronically over acidic creates an extremely negative environment that affects all cellular functions from the beatings of the heart to the brains function. This condition is called acidosis. Almost all health care provider either alternative or mainstream, will agree that most health problems, including cancer, begin in an acid environment within the body. Most people don’t know that if your pH drops below 5.8 you cannot absorb the vitamins A, B, E, F, and K. Nor can you absorb valuable minerals like sulfur, potassium, calcium, vanadium, chromium, iron, or zinc. It doesn’t matter how much of these supplements you consume; you may literally be flushing huge amounts of money down the toilet. We are meant to be alkaline on the inside of our bodies. Diamond Creek IONIZED 9.5pH Alkaline Natural Spring Water is the fastest and most efficient way to aid in the balancing of alkalinity in your body. Diamond Creek IONIZED 9.5pH Alkaline Natural Spring Water is slightly higher in pH than the blood, thereby relieving the stress on the body to keep your pH balanced where it is supposed to be. Dehydration: Estimates are as high as 90% of the population is dehydrated, and they don’t even realize it. Research has proven a body needs one-half of its weight in fluid ounces of water per day just to remain properly hydrated. All water does not hydrate efficiently. One example is distilled water. It is devoid of all minerals, extremely acidic, and will tend to dehydrate you. The average pH of distilled water is 4.5, and that is almost 1000 times more acidic than your blood, which has pH of 7.365. To hydrate your body optimally, you should be drinking water that is uncontaminated, alkalized and mineral rich. This water also acts as a conductor of electrochemical activity from cell to cell. Free Radicals: Have been shown to be the major cause of premature aging. They are atoms, ions, and molecules derived from oxygen that cause cellular damage within our bodies. They are so destructive because they are missing an electron to balance it. The body’s defense system for free radicals is called antioxidants. Antioxidants act as neutralizing agents within the body. They give up the necessary electron to the free radical and by doing so block the damage to cells within the body. Antioxidants are supplied by our diet and can be fortified by additional supplementation. There is a lot of research showing a relationship between antioxidants and the strength of our immune system. 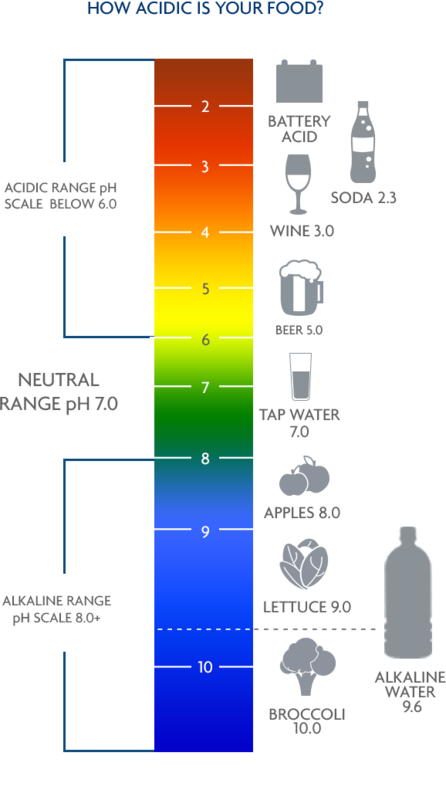 IONIZED alkaline water functions as a super liquid antioxidant! This is because it is loaded with negative hydrogen ions to help neutralize free radicals and rid your body of this acidic waste material, sparing your cells from the damage that leads to aging and disease. Just by drinking your ideal daily goal of IONIZED alkaline water you properly hydrate your body, rid yourself of acidic free radicals and strengthen your immune system. Estimates are as high as 90% of the population is dehydrated, and they don’t even realize it.